Japanese encephalitis is a disease caused by the mosquito-borne Japanese encephalitis virus. 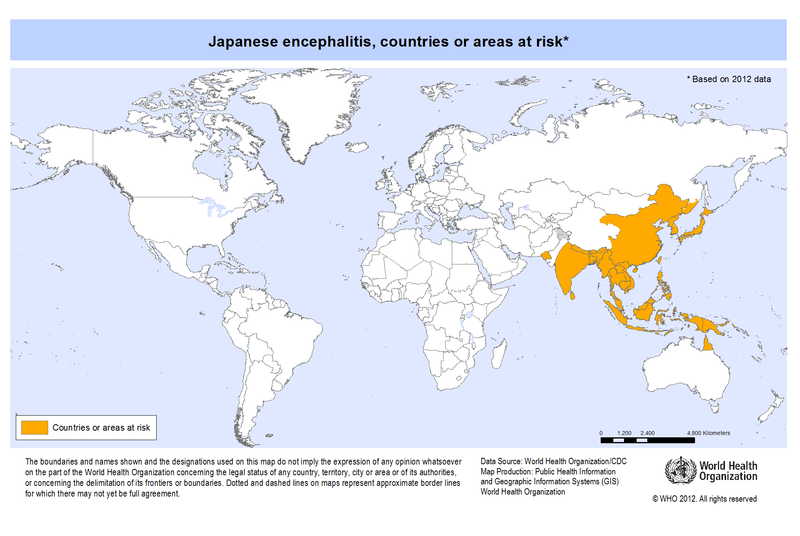 The Japanese encephalitis virus is a virus from the family Flaviviridae. Domestic pigs and wild birds are reservoirs of the virus; transmission to humans may cause severe symptoms. One of the most important vectors of this disease is the mosquito Culex tritaeniorhynchus. This disease is most prevalent in Southeast Asia and the Far East. The map below is from the World Health Organization and gives a general distribution of the problem. Do not make your own assessment from this map, but rather discuss the issue with your doctor prior to travel.